Municipal authorities in Mumbai could take a cue from Navi Mumbai on managing building debris dumped in landfills. Maharashtra’s City and Industrial Development Corporation (cidco) and a non-profit, Youth for Unity and Voluntary Action (YUVA), have jointly set up a plant in Navi Mumbai that converts debris into relatively cheap and durable concrete blocks, bricks and paving blocks. The cidco-YUVA B uilding Centre in Kharghar town started operations on February 11. A recycled concrete block costs Rs 21 as against Rs 28 for a block made from fresh material. The recycled blocks were tested at CIDCO laboratory; their strength was above average, said Kishore Wankhade, senior research associate with YUVA. “It is the country’s first such commercial facility,” he said. 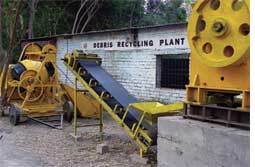 “We started the debris recycling plant three years ago on an experimental basis. It has been upgraded and can produce 1,300 hollow concrete blocks and 4,000 pavers a day,” he added. The recycled products are economical and would save on use of fresh construction material, Wankhade said. Mumbai, for instance, consumes 1.8 million clay bricks a year. The plant receives waste in the form of concrete lumps, stones, bricks and broken tiles. These are segregated and useful waste is fed into a crusher and reduced to 7 mm to 10 mm particles. The crushed debris is mixed with cement and water to produce concrete blocks. The total cost of the facility is Rs 30 lakh; a part of the cost (Rs 18.26 lakh) was borne by the Building Materials and Technology Promotion Council under the Union housing ministry. cidco provided the 3,500 sq metre plot for the plant at a nominal lease amount of Rs 900. CIDCO chief planner D V Shekdar said he plans to introduce debris recycling plants at Kamothe and Airoli in Navi Mumbai. Discussions are on with Mumbai Metropolitan Region Development Authority to set up a similar facility in Mumbai.